Armed with this poster, you’ll never again be stumped when playing Trivial Pursuit or Jeopardy. There are infographics–and there are infographics. Count this in the latter category. A Visual History of the American Presidency isn’t meant to convey a single message–but rather, it’s filled with entire book’s worth of information, in 18 different graphs. What’s more, it’s for sale as a high-quality print, starting at $30. Let’s break down some of the details. Here’s an absolutely brilliant chart: To the left, you see a single line that summarizes all the major economic indicators for each time period. The dark green is change in GDP, the light green is inflation, and the olive drab is unemployment. Other graphs chart the president’s approval ratings, his influential on the Supreme Court, and the wars he fought. Brilliant, brilliant stuff. 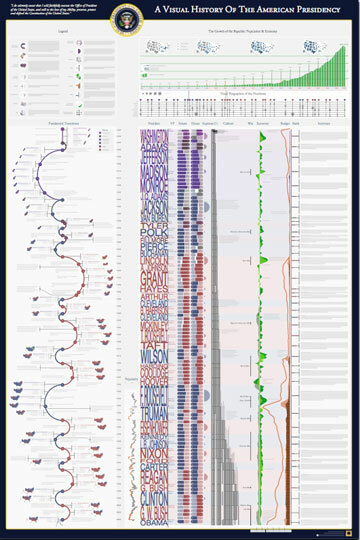 You can buy the poster here, and also view a zoomable, interactive version.